We are always keen to experiment with new fabrics and new styles too – if you have a particular idea or fabric you wish to use! 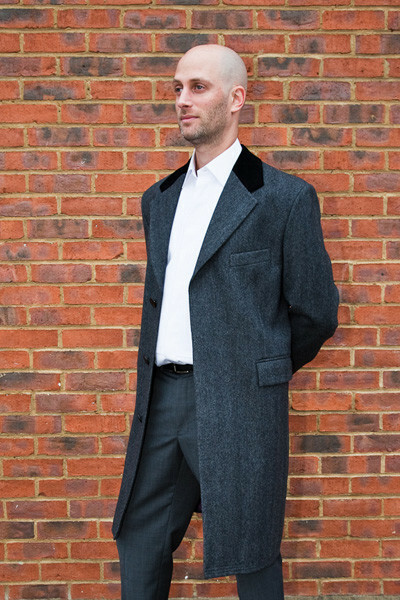 This overcoat, made for a gentleman in London, is finished with a velvet collar trim, contrasting a grey charcoal wool. Handmade, the overcoat is made and cut in England. As with every overcoat we make, unless you choose our Express service, the overcoat will take 8-9 weeks to make – we have a half way baste fitting and then a forward baste fitting before the overcoat is finished and delivered. The cloth was from Holland & Sherry and the lining from Dugdales in Huddersfield. The cloth is 100% wool with horn, working buttons. See also: bespoke tailors, men's wool overcoat, winter coat. Bespoke Overcoats by Henry Herbert Tailors. Henry Herbert Tailors make by hand the most luxurious coats including cashmere coats, overcoats & winter coats for men using the finest British wools.